Periodically our son and grandson come to search the stuff stored in our attic for toys and memories. 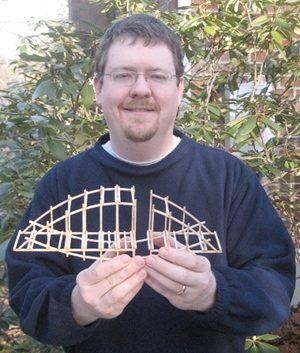 This past visit, they found a balsa-wood model bridge that my son had built in high school for a classroom contest. I had suggested that the catenary shape might be the strongest shape to use for the weight-bearing parts of the bridge. I left the rest to him. During the contest, the bridges were subjected to increasing weight until they broke and dropped the weight. He recalls that his bridge came in second, but in a way, was the best one because his design used the least amount of balsa wood – it was light weight but very strong. What is the catenary shape? It is the shape of the St. Louis Arch and of many ancient and modern arches used in architecture; the shape is most easily achieved by hanging a chain by its two ends. The natural shape (upside down) it takes between the attachment points is the catenary shape. It is also very close to the shape of the ends of an egg. While teaching physics, my students showed how strong this shape is. In a simple demonstration two students held a bed sheet between them to act as a catching net. A raw egg (the free-roaming chicken, barnyard eggs are best for this) is thrown hard into the sheet by another student, and, unless the sheet is missed, the egg will not break. At least I never saw it break from hitting the sheet, assuming the catchers did not let it roll off onto the ground. The other impressive demonstration requires two straight-sided glass cylinders, such as drinking glasses, where one glass will fit closely inside the other. The egg (raw) is padded below and above with a sponge or folded paper towels, for example, and placed in the larger glass. Important! The egg is placed so the long axis of the egg is parallel to the sides of the glass; in other words, the egg is placed “on end” in the glass. The bottom of the inner glass is then slid into the outer glass until it is resting on top of the padded egg. Using a chair to steady the person, and standing on a stool about the same height as the nested glasses, he or she gradually places all of his or her weight on the upper glass showing that the egg will support the weight without crushing. Of course, there is a limit of how much it will support. When I last did it, I probably weighed about 200 lbs, and did not break the egg. Isn’t it amazing, that the law of gravity, as established by the creator, is what causes a chain to hang as it does, that this same shape is that of the eggs laid by various birds and reptiles, and that it forms the strongest type of free-standing arch? Isaiah 34:15 says, “The owl will nest there and lay eggs, she will hatch them, and care for her young under the shadow of her wings.” God loves us and also invites us to abide in His strong shelter. forgive me it was the manhattan declaration..Boy you can tell this is monday, Hope your day is better then mine.